Hi blogging friends. Did the week before Christmas and Christmas week just seem to disappear in a flurry of panic, anticipation, and fun and frolic? Wow! I hope everyone had a wonderful Christmas and is looking forward to the New Year. Today's card is for the challenge at Sassy Cheryl's. It's challenge 146 and the theme this time is "We Love Snowmen" I do love snowmen, so this was a challenge I wanted to participate in. 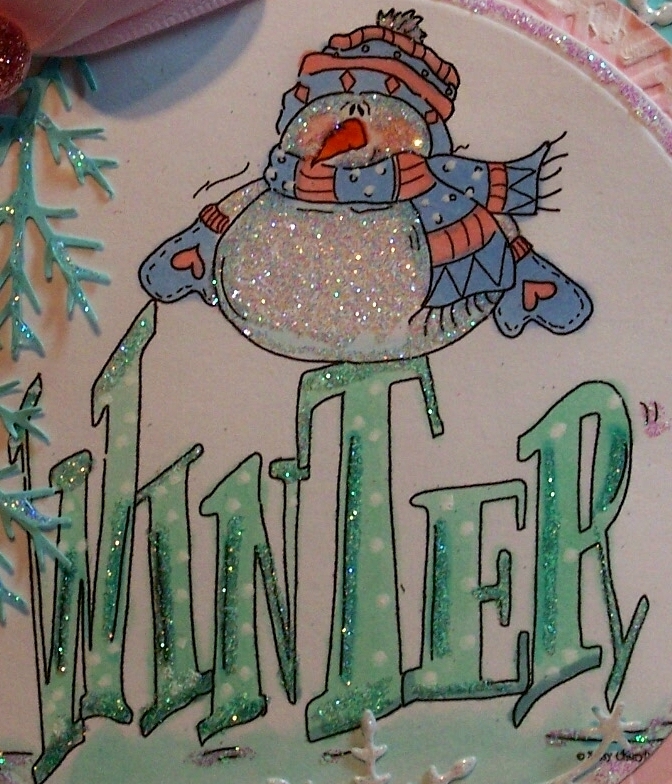 Cheryl has a lot of snowmen stamps and even some in the bargain bins. 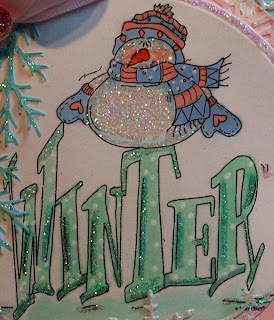 I chose this little guy, sitting atop the word Winter. the first time in a long time, even my 14 and 12 year old Grandkids were excited. Woderful card! It's so sparkly, and I love the colors you've used! Oh love all your snowflake embellies on this darling image. Not much crafting going on but hoping to tonight some! Things are finally slowing down a wee bit for me! Happy New Year and my best to you in 2013! Beautiful work Sue, the snowman actually looks cold, must be all the wonderful glitter:O) Love the die cuts! 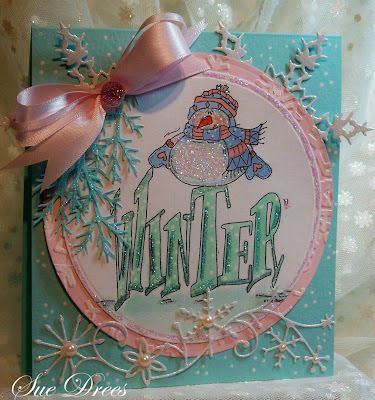 Have a very happy New Year and happy crafting in 2013! Well, Sue. . .you know I always ADORE your cards. This is lovely. . .and the 'sparkle/glitter' is a fabulous touch. Thanks for playing in the Sassy Cheryl's Snowman challenge this week.